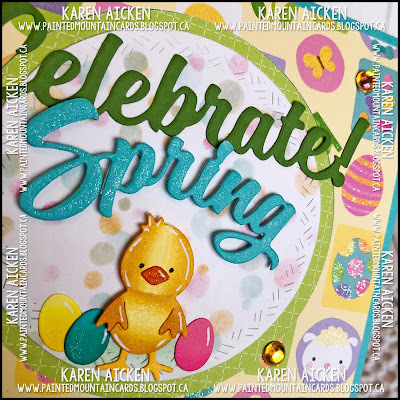 Welcome to Karen Burniston's April 2019 Designer Challenge, with the theme: "EASTER OR SPRING" - incorporate the Easter charms, Spring animals or Happy Spring into your project with an Easter or Spring theme. Here is the front of my card. 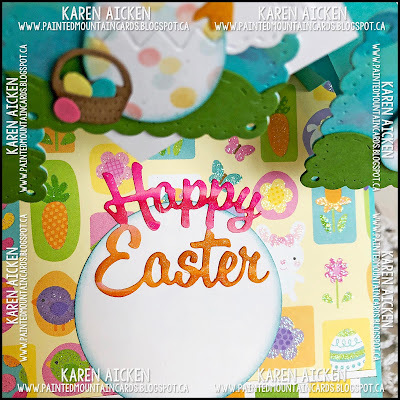 The patterned paper has embedded sparkle in it and I added a double layer of the Crosshatch circles. The top layer was actually cut from white card stock and I added the soft polka dots with a stencil. 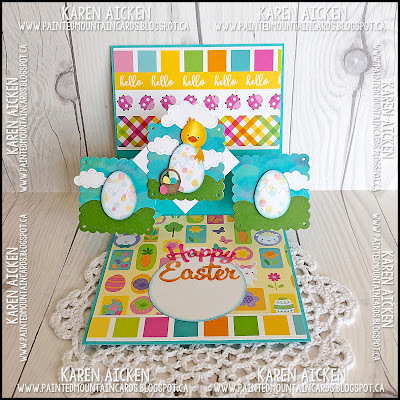 I coloured the die cut chick and eggs with Chameleon Color Tone markers, for a nice gradient colour. Snipping off the 'Happy' from the Happy Spring I was able to change the greeting on the front to read "Celebrate Spring". When I was looking at the photos though, I wish I had cut away the explanation mark from the Celebrate but it is glued down now and I didn't want to risk messing up the card by attempting to remove it. 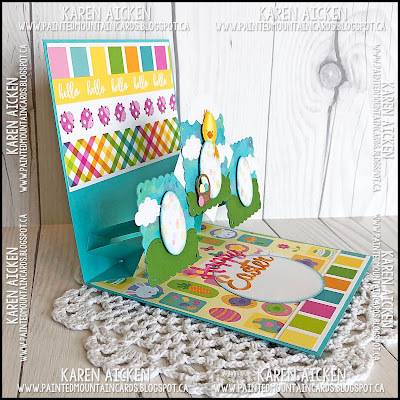 Inside I used the Upsy Daisy Pop-Up to animate a polka dot egg on each outer panel and a little Easter scene on the centre panel. The eggs each got the same polka dot stencil using soft colours. 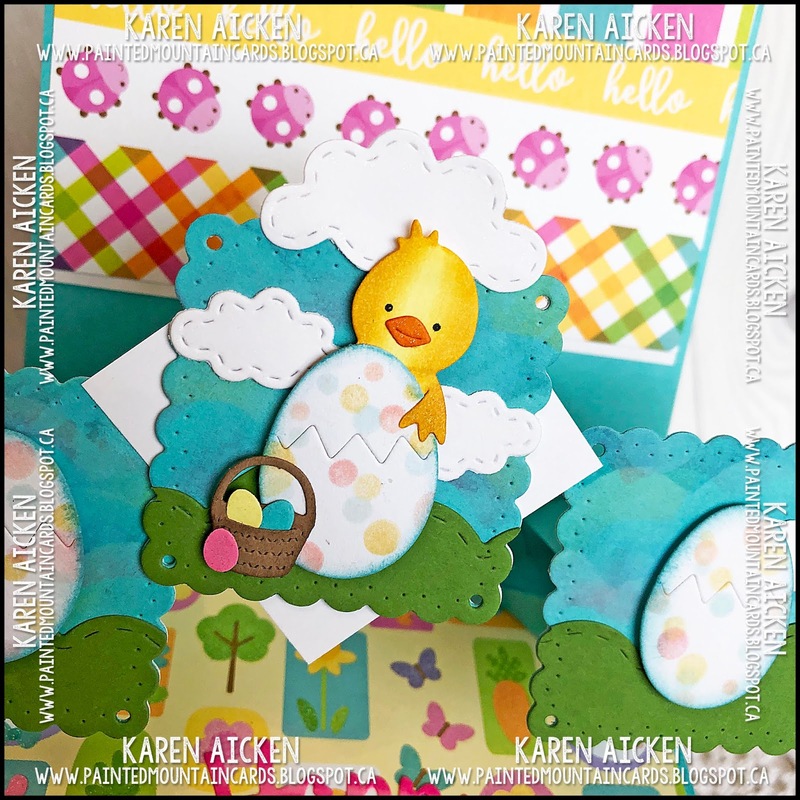 The chick from the Easter Animals is SO cute - I just love him! Rather than use Bakers Twine to tie the three panels together, I added a white card stock square turned on the diagonal & adhered to one of the egg panels. The Happy Easter was also coloured with Chameleon markers, this time I used the Color Tops to get both pink and orange from a single marker. Then I went over the die cut with a glitter pen for some pretty sparkle and shine. Below is a side view so you can see the dimension you get with the Upsy Daisy Pop-Up. Finally, for those that like to pin fronts and insides to their Pinterest boards, here you go. Check out what the rest of the Design Team came up with for the challenge - their blogs are linked on the right. 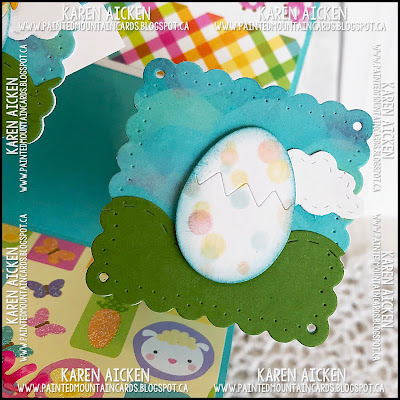 Karen Burniston will have her project and a group post on her blog tomorrow (Wednesday). How could you not thing Spring with all these yummy colours! Looks Great!